The Marula Clean-up crew - There is an elephant in my garden! Well, we certainly have had our share of elephant visitors this weekend! I posted the photo below on Facebook on Saturday with the caption ‘The Marula clean-up crew has arrived’. I was actually joking, not knowing that they would – in fact- do just that! On Saturday, I had to go pick up Steven from the bus. He had been in Pretoria for his B-Tech contact week. And since I left in a bit of a hurry, I forgot to close the gate behind me. Now the two Marula trees in our garden are producing so much fruit, I just cannot keep up with the jelly making. So there are piles of fruit lying around. Too much fruit for an ellie to resist! 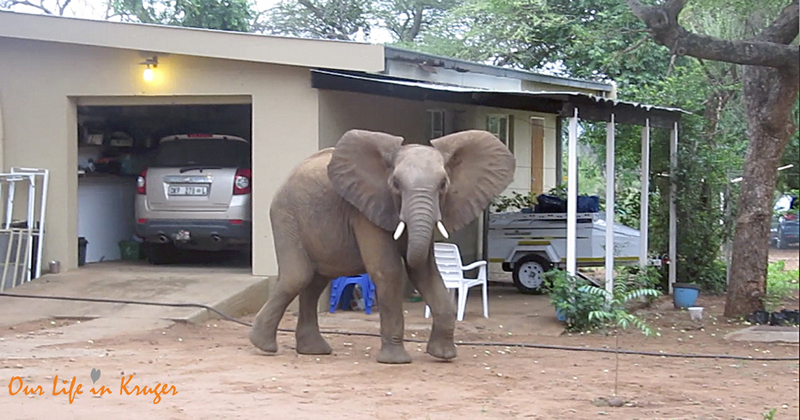 So no surprise: when Steven and I got back, there were two elephants at the front gate and one inside! I really could not blame them. “Eat the delicious fruit guys, I don’t mind. Just leave my veggies please!” I said through the open window. My pepper plants are just starting to grow tiny little green peppers, and I would really like to harvest them! With us driving into the yard and all four kids happy to see their father, the commotion was a bit too much for the young ellie bull, so after another trunk-full of the juicy fruit, and a bit of encouragement from Steven, he left our yard. Steven closed the gate behind him so the kids could come outside and play. We were planning a lekker braai that evening and Steven’s oldest son, Aiden, wanted to help start the fire. He went outside to take the braai tongs and blitz to the lapa. In a split second, he was back inside! He looked like he had seen water burning and struggled to get the words out. “There are elephants!! !” He yelled as he pointed to our braai area. I thought he meant at the fence, but when we looked out the window, they were not at the fence at all; they were inside the yard at our braai! Poor Aiden almost bumped into them and got such a fright he fell on his bum. Quietly, I crept onto our little stoep at the back for a video. Steven closed the gauze door behind me to keep our curious kids inside. “Olifant aaien?” Alex asked me. Which is Dutch for “Can I go pet the elephant?” “Better not my lovie, elephants don’t really like to be petted.” I whispered back from my relative safe spot at the door. After a bit of a head-shake and display for my attention, the three elephant strong clean-up crew left the way they came: through the mangled gate by the lapa. The next morning, I slept in a bit while Steven took the ‘early shift’ with the kids. I was slowly waking up when I heard an elephant scream close by. Well, I shot out of bed like a ‘Jack-in-the-box’ and opened our curtains. Three more elephants in the yard! This time it was a cow with a young calf and a youngish bull. The morning shift of the Marula Clean-up crew had arrived. I grabbed my camera and quickly made my way into the lounge, where the kids were having breakfast. “Tannie Linda, look at the elephants!” Aiden said quite matter-of-factly as he took a bite of cereal. I suppose the kids got used to having elephants in the yard. Where they were at the window with their faces pressed up at the glass the previous afternoon, this morning they were quite happy to stay at the dining room table and eat their breakfast, while the elephants were enjoying theirs. Isn’t it amazing to think that this is their ‘normal.’ They don’t know anything else but this: the Kruger National Park is their backyard and elephants come and play. Monkeys are naughty and we are not allowed to touch the tortoises and snakes. I love it! Anyway, I went to our front door for some photos. The cow was hoovering up the marula fruit with her trunk faster than you can say hoovering. Her baby was also enjoying the Marula feast and was shoving the ripe fruits into her little mouth. Mum was in such a hurry to eat all of the Marulas, she almost tripped over the kid’s scooters that were strewn about under the tree. After mommy almost tripped over the children’s bikes, baby mock charged them. It was an extremely comical sight! Both bigger ellies picked up my movement and gave me a bit of a display. Nothing to get your adrenaline going early morning than an elephant that takes a few quick steps towards you, ears flared out and all! The three ellies retreated the way they came in… through the half broken gate at our lapa. Leaving some party gifts in their wake. The grass in the garden next door is also very overgrown and in need of some mowing, which looked like their next job. Thanks, Kruger Garden Services, for sending your Marula Clean-up crew. It was truly an entertaining adventure this weekend! This is not the first time we have had elephants in the Yard. I have written a few other blog posts about our pachyderm neighbors in ‘There is an Elephant on the Driveway‘, ‘A Naughty Overnight visitor‘ and ‘There is an Elephant at my Window‘. Amazing stories “So mooi vertel” Vir n Nederlandse girl het jy so mooi in Afrika aangepas. Jy het n wonderlike skryf talent. We enjoy your stories so much. Thank you. Ag baie dankie, Jan! Waardeer! Have a Wonderful Weekend and thanks for another great Blog post. Thanks, Denise! They were quite well behaved as far as elephants in the garden can be! A child’s innocence… It is such a wonderful thing! Haha yes, that little one thought he would scare away the scooter! Precious! I am sure they will. It is just too lovely growing up here! Ik kom straks om in de paprikas als ik van elk bloemetje een vrucht krijg! En er beginnen tomaatjes ook te groeien. Te leuk! Lovely story, as usual, Linda. Do the ellies ever eat over-ripe marulas and get tipsy? As in “Funny People”? – a movie made long before you were a twinkle in your mother’s eye, I’m sure. I look forward to reading your wonderful stories, the night cam stories and Steven’s stories. What a treat. I have to be honest, I think that is just an urban myth… I have never seen any animal get intoxicated from eating fermenting marula fruit. It would be too funny if they did though. Like in the movie ‘The Gods must be crazy’! Glad you like reading our stories! We are having a great time writing them down! Such a lovely story Linda; I enjoyed watching the ellies hoovering up that delicious fruit. Such a treat for them! But I think my favourite sentence was ‘This is their normal’ regarding your kids. So true and so wonderful. They must be learning many skills from you and Steven without anyone realising it – skills that will make them bush savvy as they grow up and that will give them a real love for the wild places. You make it all sound so much fun, but there must be a lot of really hard work involved in living where you do as well. I hope so, Sal! Stevens daughter is 10 and she is saying she wants to be a game ranger just like her dad. Aiden wants to be a snake handler when he is 14! lol. Wonderful experience for you all. Wish I was one of you children, what an amazing place to grow up in and what shines through is your appreciation and amazement of where you are and how fantastic it is. Love the pressies the ellies left for you. Maybe the kids could move them to the other side of the fence. Ag shame, poor Aiden, here he is the big brother and has to run inside because of the ellies. Tell him well done, not wise to hang around with them. Thank you so much for your lovely comment, Brigitha! I am going to use the dung as fertilizer for my veggies! ;-)) My tomatoes seem to grow nicely on elephant dung! lol! What a wonderful life! Thank you for sharing all your joy with us. What a great story and experience, I love to read your blog about your life in Kruger, the way you tell the stories brings a smile to my face! Dank je wel voor je lieve comment, Marguerite! !